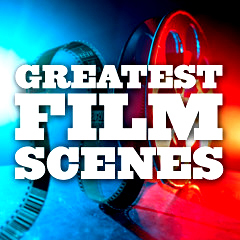 Filmsite has compiled its own extensive collections of 'greatest scenes' material of the most famous, distinguished, unforgettable or memorable images, scenes, sequences or performances, many from the greatest films of all time. This is an enormous collection of descriptions (with dialogue and selected screenshots) of the greatest film scenes and moments of all-time. It is not limited to 25, 50, or 100 selections, but hundreds. Included are memorable lines of dialogue (and famous quotes), fantastic visual effects sequences, scariest moments, best action scenes, ground-breaking moments, unusual entrances, intriguing and classic characters, fantastic performances, incredible moments of directorial flair, surprising revelations, unusually inventive images, great death sequences, examples of great script-writing, excerpts from controversial films, magical dance movements or musical songs, striking opening and closing scenes, and so much more. have also compiled their own selections of greatest movie moments.